We all know it deep down but we always live in hope don't we? With the British weather I mean: it can be gloriously hot one minute, then seriously cold the next... We always hope the warm spell will last, but it never does. Not really! And that's where these soup2go mugs come in. We do still need that mug of hot soup, even in the summer. Just perfect with a cuppasoup on the run, on a picnic, or even at the desk in the office at lunch! These have just arrived in the shop, in all colours of the rainbow so hopefully they will warm you up! These are totally microwave safe, dishwasher safe and freezer safe. They have a lid that clips tightly shut on the mug, to avoid any unnecessary spills and come with a strong sturdy handle. With room for 656ml, that's a huge mug of soup by anyone's standards (standard mugs are about 300ml), so this can cater for smaller and larger appetites. You can even heat up a whole tin of ready made soup in them! And before you ask, these are made from BPA free, lead free virgin materials, that are 100% safe for food. We have got them at a special introductory price, so do hurry on over and take a closer look in the shop! We just have a limited supply! Or, if that sounds like too much organisation is required, then you can always have a handy supply of cuppasoup in your desk, a kettle in the office and the mug, ready for that cold snap! Alternatively you can take in a tin of soup, decant that into the clean mug, pop in your microwave, have a handy bag of croutons, or a fresh roll, and that's your heart warming lunch! Now I am dying to ask. What is your favourite flavour of soup? 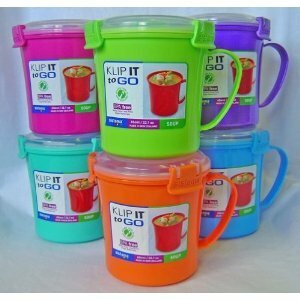 And of course, what is your favourite colour of these soup-to-go mugs?